You will not grow if you sit in a beautiful flower garden, but you will grow if you are sick, in pain, experience losses, and if you do not put your head in the sand, but take the pain and learn to accept it, not as a curse or punishment, but as a gift to you with a very, very specific purpose. My editor liked my dance article. Getting offered a week's trip to Boise in a couple of weeks. I was lying on my back choking. When I looked up, all I could see was sunflowers--beautiful sunflowers--and pears. More types of pears than I knew existed. No, I wasnt lying in some surreal agricultural field. I wasnt having a weird dream. I was in the dentist chair and Sara, the hygienist was working diligently on me with the ultrasonic cleaner, the little vacuum thingy missing some of the water, which was sliding down in my throat, where I couldnt swallow. 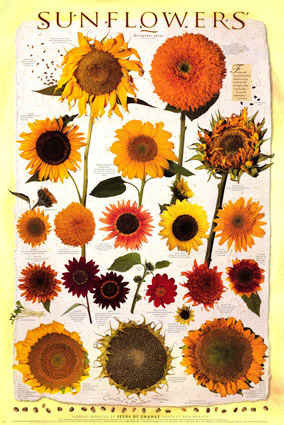 On the ceiling above me were large posters--one of types of sunflowers, one of varieties of pears. Theres something very peaceful, being able to lose yourself in a virtual field of sunflowers when there is pain going on in other parts of your body. Actually, as pain goes, ultrasonic cleaning hardly rates a blip on the pain-o-meter. Sara commented that my teeth were in better shape than when I was in last. We both chalked that up to improvement in my shoulder, allowing more efficient brushing technique. With nothing better to do than think of sunflowers and struggle with the liquid in my throat, I began to think back over Dentists I have Known. There havent been a lot of them, but they each left unique impressions. My first dentist was Dr. Macy, who was a friend of the family. Dr. Macy had an office in a reconverted set of flats. I remember the green and black linoleum that echoed as I walked down the hall to the office and knocked on the glass of the office door and entered the darkened room which overlooked the streetcars running along street below. I was terrified of that office. Bad things happened in that office. I suppose in his day Dr. Macy had been a good, state of the art dentist, but he was an old man and had not changed with the times (and this was the late 1940s/early 1950s). High speed drills had come in by this time, and modern dentists were using x-rays, but Dr. Macy stayed with his slow drill and never took x-rays. He filled some cavities for me and it was always painful. The slow speed drill would get hot--there was no water spraying on the tooth to cool it off--and probably the novocaine didnt fully take either. I was terrified of those appointments with Dr. Macy. When he finally retired, he referred me to Louis Schmoll, who worked in a big modern medical high rise in downtown San Francisco. The first thing I noticed about Dr. Schmolls office was that it was bright and airy. He had a staff, unlike Dr. Macy, and the first thing he did was to take x-rays of my teeth. He was appalled to discover that Dr. Macy had missed thirteen small cavities. I was set up for lots of dental work. I came to enjoy those sessions. The staff was pleasant, the novocaine worked, and the drill was high speed, cooled by water. He got my teeth in good shape and I was very sorry to have to ask him for a recommendation to a new dentist when I moved to Berkeley. Herc was a flower child doctor. Holistic before it became trendy. I remember him as a big bear of a man, with big hair, a bushy beard, and bad breath. It always struck me as odd that a dentist, of all people, would have such bad breath. But sometimes it just nauseated me to have him in my face working over my teeth. During that time, however, there was another dentist who made a huge impression on me--and a lot of other people. One of the fathers in the cooperative nursery school our kids attended was a dentist and he decided that hed give a fluoride treatment to all the kids in the school. This happened to be on my work day and what a nightmare it was. The kids all started getting sick from swallowing the fluoride and by the middle of the morning, we had kids all over the school throwing up. It was one of the most memorable days we ever spent at Tiny Tots!! Cindy entered my life as a friend and co-worker for many years, gradually becoming my dentist when I finally had a dental emergency I couldnt ignore any more. It was a delight to discover, first of all, the advances that had been made in dentistry in 20 years, and secondly, Cindys delightful approach to dental care. The office is light, airy, friendly, with music playing in the background, and hygienists, assistants, and Cindy talking back and forth between stations much as they would do between chairs in a beauty salon. Ive had a lot of work done over the eight or so years that Cindy has been my dentist, but its all been for the most part pain-free and I actually enjoy the time I spend there. Cindy and I get caught up on gossip, in my pre-accident days we planned bike rides or compared places wed biked. And I love the posters on the ceiling. Knowing that Sara will send me on my way with a clean mouth and an appointment to return in another four months, Im free to lean back, look at the sunflowers and think about other things.